Joaquim Rodriguez (Katusha) took the fight to his Vuelta a España rivals on Sunday, breaking clear of the contenders’ group and overall leader Fabio Aru (Astana) on the tough final climb to take stage 15 and move within one second of the red jersey. Spaniard Rodriguez gave a performance to please the home crowd, attacking a select group of race favourites in the dying kilometres of the 176-kilometre stage, featuring a first category ascent to Sostres in the finale. Rodriguez simply out-paced Aru, as the latter rocked his bike and fought for breath to minimise his time loss. Aru’s effort was untidy yet effective, and the Italian clung onto the overall lead by just one second after placing fifth behind Rodriguez. Rafal Majka (Tinkoff-Saxo) placed second on the stage, with Rodriguez’s Katusha team-mate Daniel Moreno in third. Colombian hope Nairo Quintana (Movistar) seems to be improving each day after suffering with illness earlier this week. He was one of the first to attack on the climb, and although the move was short-lived he finished at the same time as Aru. 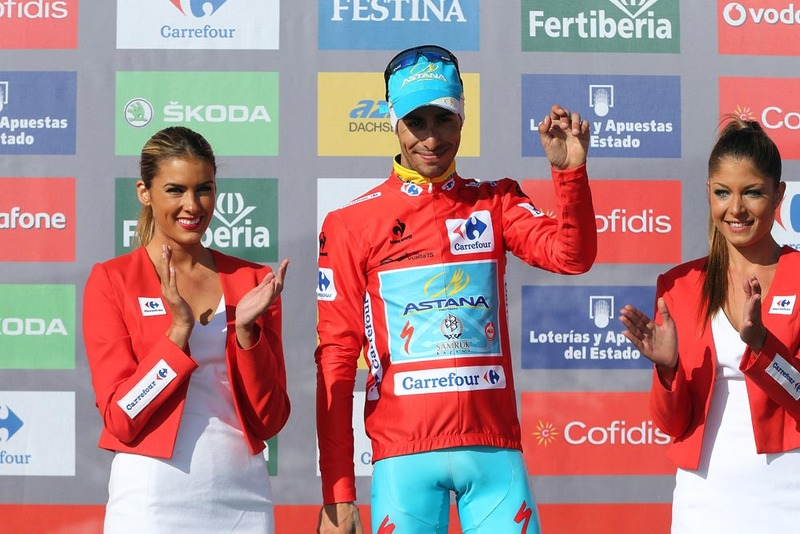 Rodriguez adds this Vuelta victory to eight previous wins in the race, and two stages of the 2015 Tour de France in July. He must now be dreaming of his first overall victory in a Grand Tour. Before the overall contenders provided the fireworks, a nine-man break had led the way consisting of Natnael Berhane (MTN-Qhubeka), Blel Kadri (Ag2r), Nikolas Maes (Etixx-QuickStep), Brayan Ramirez (Colombia), Pierre Rolland (Europcar), Dominique Rollin (Cofidis), Maarten Tjallingii (LottoNL-Jumbo), Ricardo Vilela (Caja Rural) and Haimar Zubeldia (Trek Factory Racing). With the catch imminent as the leaders hit the final climb, Zubeldia struck out on his own from the escape, but stood little chance of keeping the chasing GC men at bay after a tough day. Aru will attempt to defend his one-second lead over Rodriguez in another mountain stage tomorrow, before Tuesday’s second rest day. Stage 16 from Luarca to Ermita de Alba Quirós looks like a tough one for Astana to police, with six categorised climbs before another brutal mountain-top finale. The GC will then undoubtedly be shaken up on Wednesday, with stage 17’s individual time trial. The race concludes on Sunday, September 13, in Madrid.